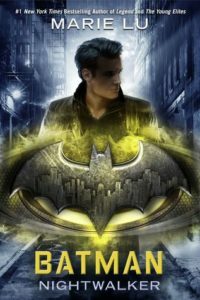 Summary: As an eighteen-year-old Bruce Wayne is graduating high school and inheriting his families company and fortune he becomes entangled in the crimes of Gotham City. When trying to stop an escaped criminal Bruce lands himself on probation at Arkham Asylum. While cleaning floors he meets an elusive member of the group called the Nightwalkers, a group determined to kill the rich of the city and use their money to help the under privileged. Madeleine has been arrested for the murder of three prominent Gotham citizens but refuses to talk to the police. However, something about the young billionaire starts her talking. As Bruce gets more involved in the case, he sees that he could be in danger too. Batman was probably my first superhero. I remember watching Michael Keaton play the caped crusader and being a little scared of the dark plotline. I continued to follow the Bat of Gotham through the Dark Knight trilogy (Heath Ledger as the Joker—AMAZING). Now I currently watch the show, Gotham on Fox, which follows the younger years of Detective James Gordon, Bruce Wayne and the villains like Penguin and the Riddler. Lu’s depiction of Bruce reminded me a lot of the boy in Gotham. She does a great job of bringing him to life and carefully crafting him into the superhero he is to become. I really enjoyed the relationship between Bruce and Alfred his protector and guardian. It is one of my favorite parts from the movies and TV show as well. They have a bond that is deeper than blood. Alfred takes care of him but also has respect for the man he is becoming. At the same time though Bruce realizes that Alfred means more to him and that without him he would not be who he is. The story also touches on themes of the times. The struggle between the upper and lower classes, racial tensions and the need to equal rights for all. Batman is a symbol that something good can live in such a dark place. Lowlights: I missed not having the normal Batman villains. Madeleine was okay. Most of the Batman villains are flashy with lots of humor thrown in. She was smart but a little dull. I am looking forward to the villain story in Catwoman: Soulstealer by Sarah J. Maas later this year! 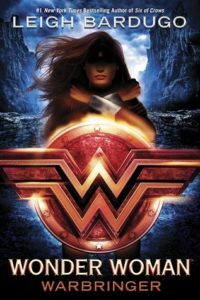 FYI: Check out Wonder Woman: Warbringer by Leigh Bardugo! First line: You do not enter a race to lose. Summary: Diana was born on an island of immortal women called the Amazons. Her mother is the queen of the Amazons. She has never been off the island or even met a man. When Diana sees a shipwreck off the coast of the island, she breaks the laws of her people and rescues a young girl from the wreckage. However, once Alia, a young student, is brought onto the island mysterious things begin to happen. In order to save her home and her fellow Amazons Diana has to take Alia off the island and break the curse associated to her lineage and blood. Highlights: I loved the Wonder Woman movie so I had to read this! I have never read anything by Leigh Bardugo but I will have to now. I liked the adventure and action. It was fast paced and fun. This was a good reimagining of one of the best female superheroes. Diana is strong willed and brave. She is a role model for young girls. Lowlights: I was thrown off at the beginning because the story takes place in modern times. Diana is a teenager that is still training to be an Amazon. This is a different spin and completely different from the movie. It took me a while to get used to the idea but it worked well. FYI: This is the first in the DC Icons series. Next is Batman by Marie Lu, Catwoman by Sarah J. Maas and Superman by Matt de la Pena.